The Piquette Ts held their fourth tour of their first touring season today. Key feature of the tour was driving around the east side of Detroit and the Grosse Pointes (just out of town). The destination of the tour was the Edsel and Eleanor Ford home on Lake St. Clair. 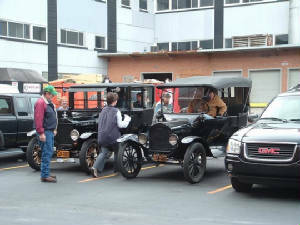 As has become the tradition with the Piquette Ts, the tour started at the Ford Motor Company Piquette Plant. The weather was not real friendly for open car riding, so many of the passengers bundled up very well. After driving past the site of the first Ford factory on Mack Avenue in Detroit, the tour winded its way through Indian Village, then along Jefferson Avenue to Grosse Pointe, eventually arriving at the Ford home. 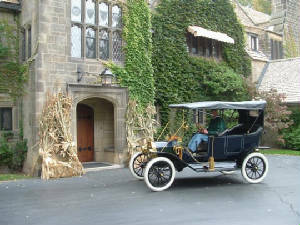 Each Model T on the tour was pictured at the front door to the house. This is a very nice 1912 Touring Car. After the Ford home, the tour proceeded to Mike Skinner's home in St. Clair Shores for the end of year and Piquette Plant - T-Plex Volunteers appreciation picnic. A grand, although cool, time was had by all. The open car passengers are expected to recover soon.